We’re Shelling Out $1,000,000 in Total Cash Prizes! Are You Fast Enough to Win? Our underground racing phenomenon is no longer a secret! 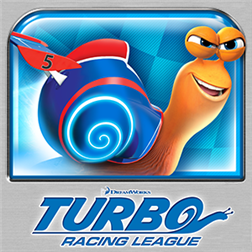 Join the TURBO RACING LEAGUE and drive like you’re shell on wheels! Head down to the Garage where Tito will show you the ropes and help you trick-out your own sweet ride! Qualify for each weekly contest to race, drift, slide and jump your way to the winners circle in the $1,000,000 Shell-Out Brought To You By Verizon! For 8 weeks, the 10 fastest racers will earn cash prizes from a pool of $500,000! 1st Place winners from each weekly race will win a trip to Los Angeles to compete for $500,000 in total cash prizes in the Live Grand Finale Race Event! • Leaderboards show how you rank amongst your friends and all the top players! Join the conversation at Facebook.com/TurboRacingLeague! DreamWorks Animation’s Turbo races into theatres July 17, 2013!